Building your own arcade controls isn't for everyone. Tools, expertise, time, convenience... some folks just want to buy something and hook it up. This page is for you! READ THIS BEFORE BUYING FROM ANY VENDOR LISTED HERE! Generally though, the vendors currently mentioned in this FAQ are great people to work with. Several regularly offer their expertise for free on the message board, giving away advice and techniques that could conceivably be costing them in lost sales opportunities. Whenever possible, I post feedback both good and bad in the reviews section of the main FAQ. Arcade Solutions Joystick Controllers BACK IN BUSINESS! This piece has been deleted. Keeping up with changes proved difficult rendering this almost worthless. The HotRod measures 24" wide, 11" deep, and 6" tall and weighs approx... 15-16lbs. HotRod is a digital joystick. This gives the players the best nanosecond response times while playing with the fastest of todays computer hardware and software. HotRod -classic model has 10 independent arcade style microswitch buttons, 2x8-way arcade style microswitch joysticks, and player one and two start buttons. 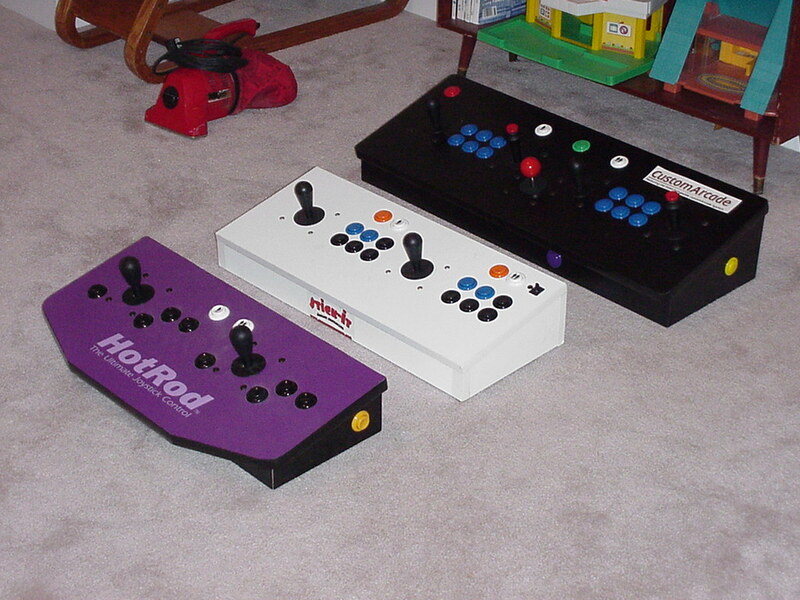 All HotRod models use the Happ(tm) 'super' 8 way joysticks. Made in the USA, with a 6 month workmanship warrantee. Currently HotRod has PC (ps/2) support. USB support is in the works. Future versions such as keyboard programmability are in the works. This is HotRod's fighting style version of the joystick. This appears to be the most popular model, has 7 buttons per player. 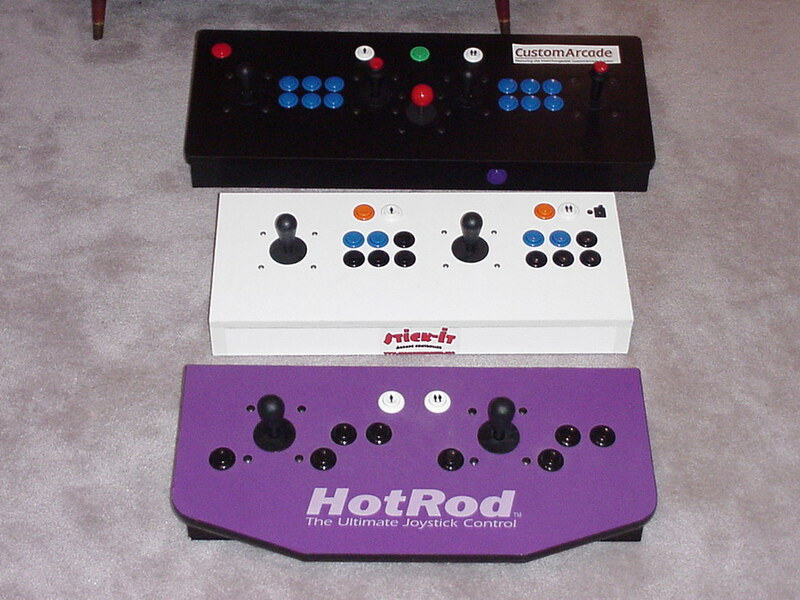 HotRod -SE model has 16 independent arcade style microswitch buttons, 2x8-way arcade style microswitch joysticks, and player one and two start buttons. Build Your Own Arcade Controls Message boards, of course! This site includes among other things a message forum, and downloadable configuration files for various emulators designed to work with the HotRod. Original Happ Controls, for that authentic arcade feel and durability. The new Xport™ external add-on allows the Home Arcade to be used on all major console systems. 18 buttons, for any gaming situation. Includes two on the side for pinball, as well as player 1 and 2 selection buttons, fully replicating the arcade look. The Home Arcade Joystick is a PC based model on the original arcade control panel designed for home use. It plugs right into the back of your PC, through the PS/2 keyboard port in between the keyboard and the PC. The Home Arcade Joystick is a low-level bios input device, and it simulates a keyboard to your computer. It was designed to replicate that classic arcade feel using retrogaming emulation programs such as M.A.M.E., Retrocade, and commercial release titles such as Microsoft's™ "Return of the Arcade", and "William's Classic Arcade hits". Home Aracde simulates that "real" classic arcade experience, by using real commercial grade arcade components, that are actually”overkill" for the home market. However, it produces a nice effect for that avid classic gamer who demands that authentic play. It is a very unique joystick, unlike any regular joystick you will find on the market. It is capable of playing 1 to 2 player games side by side with your friends, or complex arcade games that require dual joystick usage and can take the newest title releases to the next level. The unit has been rated the top controller for 2 PLAYER GAMES, as it adds serious head to head action with it’s unique layout.<p> The unit is recommended and highly suggested for users of the MAME Emulator, which allows you to play virtually any arcade game on your PC. They sell in the US and UK, for $149 US, with deal occasionally showing up on ebay. Check out our review! Other reviews linked on the reviews page. If you're interested in purchasing one, and start at this link, we receive a small commission on the sale. Arcade cabinets! They have custom arcade cabinets available not only for JAMMA, but they can also accomodate PSX, Dreamcasts, N64s, etc... They feature Wells Gardner RGB monitors, come in a variety of sizes and options, and run from $995 to $1195. They also support . . . The Super Pro.Stick! This is a 10 button, single joystick controller designed to support multiple systems, including PSX, N64, Saturn, NeoGeo, Dreamcast digital and analog, and soon IBM-PC compatibles - fully programmable! Currently going for $79.95, with an additional $30 per each additional system. Mas Systems offers a lot more than this (check out their build-your-own Dreamcast VGA Audio/Video Adapter), be sure to stop by! UPDATE - good luck ever getting them to return an email - try the phone instead. Arcade solutions takes orders in an on again off again basis - email them to see their current status. Will interface not only to PC's, but also to Playstation, NES-64, Sega Saturn, C= 64, Amiga, Atari computers and Atari 2600, and the Bally Astrocade, *OR* a multi-unit system that will interface to more than one computer/console! Now offering USB compatible controllers! Options include Happ Controls trackball, fully programmable buttons and two joysticks, and spinners. Wow! An awesome looking getup if you want one but don't want to build your own :) Being a specialist in customized products, the above information may be out of date. Check their web site for up to date information. Check out reviews of their products. Enter the OzStick! The OzStick is a slick looking single arcade desktop joystick, with 4 buttons, interfaced to the game port. They offer 3 different button layouts, and feature Happ Controls Ultimate joysticks and pushbuttons. They cost $125 AUS (roughly $73 US) including postage and handling, and are only available COD. Obviously, they are based in Australia. I'd love to hear feedback from anyone purchasing from them! Arcade Solutions is no longer taking cabinet orders. They may in the future. Contact them for current info. STATUS UNKNOWN - DOWN FOR REMODELING? MrArcade is a regular on the message board and has built numerous cabinets on the examples page. As a sideline, he's built and is willing to build custom arcade cabinets for folks. Email him for details, but to see samples of his work check out his projects. Ultimate Arcade Mark I. Ultimate Arcade Mark II. Ultimate Arcade Mark III (cocktail model). Ultimate Arcade Mark IV. Ultimate Arcade Mark V. Ultimate Arcade Mark VI. Ultimate Arcade Mark VII. Anything here is kept simply to avoid 404's. The vendors here are not in business. VENDOR OUT OF BUSINESS. LINK KEPT HERE FOR POSTERITY AND TO AVOID 404 ERRORS! The heart behind CustomArcade is modularity... Their control systems can be purchased in a variety of ways - a control panel top only (controls, no interface or box), panel with interface (no box), or panel with interface and box. They have 4 different panel configurations presently, all which use the same interface and fit the same box. Purchase one complete system, and all you need to purchase from then on is the control panel tops, saving you the cost of the electronics and box should you want multiple control panels. Additionally, their control panels fit into their CustomArcade cabinet should you choose to upgrade! The consoles range from $135 to $325 depending on which options you choose and whether you purchase the panel alone or electronics/box. Available options include multiple joysticks (4 way, 8 way, and top fire), spinners and trackballs, as well as "vibration detection" technology for pinball games. The interface is a KE72T keyboard encoder from Hagstrom Electronics, which is capable of 72 discrete inputs meaning no ghosting. The consoles come in an incredible array of colors, literally hundreds of choices, some at the standard cost, some at a premium. CustomArcade is also the only place you can purchase the StarWars Yokes originated by TwistyGrip. CustomArcade is the brainchild of Ray Iddings, a great guy and regular contributer to the message board. Definitely a system to consider, and on my short list! Visit their reviews. This controller is made specifically for MAME, using a keyboard hack with a controller from Fry's Electronics, and parts from Happ Controls. With 3 weeks of testing, he has found no problems with keyboard ghosting. Read my review for another perspective. 2 joysticks, coin up, escape, 1 plr, 2 plr, and 6 control buttons (3 each joystick). BUYER BEWARE- Stick it has not responded to emails or delivered their new product in several months. I would avoid purchasing from them until they are heard from again. PowerRamp PRODUCT OUT OF BUSINESS. LINK KEPT HERE FOR POSTERITY AND TO AVOID 404 ERRORS! "This stick is the weapon of choice for PC action games. Every single button can be programmed and customized the way you like. The ramp was the first PC arcade stick on the market." It has gotten decent reviews from the folks at Dave's Classics, both to be used "as-is" and also as a start for designing your own controls. See reviews of the PowerRamp. See head to head reviews of the PowerRamp vs. the V-Stick. The POUNDER VENDOR OUT OF BUSINESS. LINK KEPT HERE FOR POSTERITY AND TO AVOID 404 ERRORS! The POUNDER apparently is no longer in production. The old information on it will be left for aftermarket info and/or in case it comes back. The POUNDER is another stand alone arcade control set made by Douglas Prinn, and is available here. From his web page: "The POUNDER has 8 real arcade buttons, a steel shafted arcade joystick. The chassis is metal, and the top is wood, just like a real arcade machine. No plastic here. OK, so the buttons are nylon. All controllers are fully tested, and have a 1 year warranty." The prices range from US $89 to $160 depending on model, and he will customize a product for you if desired. The creator of the POUNDER has submitted an admittedly biased review which will help you get more of an idea what it's about - thanks Douglas! Yea, I'm hanging it up after the 4 units left to be completed. In the last 5 months, over 100 units have been shipped. It's been fun, but I simply can't build them fast enough to keep up with demand, and I refuse to lower the quality of service of RetroSTIK like some companies. Hiring help is really out of the question. As soon as you hire even one employee it's unbelievable the amount of additional cost and paperwork. Of course if anyone wants to buy RetroSTIK and continue to grow the market, they can contact me, but that's not where I want to go to. It just wouldn't be fun anymore. RetroSTIK is an impressive looking stand alone arcade control system. The creator of RetroSTIK is the one who suggested the diode solution to eliminating ghosting problems, and frequently lends his wisdom to the message board. One of the great things about RetroSTIK that you can totally specify the configuration you want for your system. The price may be outside of some people's range however. Nothing but good reports from folks on RetroStik. XT/AT keyboard standards, and with a plug adaptor, will also work on PS/2 systems. If your RetroSTIK™ is equipped with "mouse-like" devices (like trackball, rotary joystick, spinner) this requires a serial port and any standard mouse driver to function. To program your RetroSTIK™, you must be able to run a DOS program. The program has been tested under DOS and Windows 98/NT, but it should also work in OS/2, UNIX and it's variations. This stick should go on sale sometime in November, 1998, and appears to be targetted for those who want the ultimate in personalized gaming systems. FEEDBACK very much wanted from anyone who gets their hands on one. V-Stick VENDOR OUT OF BUSINESS. LINK KEPT HERE FOR POSTERITY AND TO AVOID 404 ERRORS! The V-Stick is not presently accepting orders, and has not been for some time. The old information will remain in case they do begin selling again. - Plugs into any PC keyboard port - no joystick card required! - Heavy-duty construction with real arcade components"
The V-Stick's web site is here. People who have used the V-Stick seem very happy with it. However, it appears to be a one-man operation, so lag times between ordering and receipt of the device are reportedly high (3 months or more). See reviews of the V-Stick. Another newcomer to the scene, PC Arcade is selling an arcade joystick for the pc available in two styles and 3 colors. It's either a 1 or 2 joystick configuration, 4 buttons total either way, and I'm guessing a joystick hack though I could be wrong. I've emailed the seller asking for more information. It's $69.99 for the 1 stick, $99.99 for the 2 stick, and $10 for shipping domestically, $16 out of the states. Dual player control panel, 10 buttons per player. 10/100 Ethernet and phone connections. Lockable access to PC components (CD-ROM, etc). Williams Arcade Classics and Midway Arcade's Greatest Hits bundled with cabinet. There's a 30 day money back guarantee (10% restocking fee == $600) with a 1 year warranty. Price does not include tax/shipping/handling. Their web site still shows signs of being new, with several unfinished sections. It's worth a visit even if the price tag scares you away :) Anyone ordering one, please let me know! PRODUCT OUT OF BUSINESS. LINK KEPT HERE FOR POSTERITY AND TO AVOID 404 ERRORS! The Havok's innovative circuitry transforms your home game system (Sony Playstation or Nintendo 64 - sold separately) Into what feels like a real arcade upright! Wood grained melamine with T-moulding (selection of finishes). Polycarbonate control panel overlay for protection with easily legible button labels. Powerful lnternal fan will keep all your AV components cool. Spring loaded drawer (locking) opens with a slight touch for easy game change - will house a Nintendo64 or Sony Playstatlon - extra convenient storage for games, remotes, etc. in drawer. Will convert controls for up to two game systems - compartments for additional systems using external controllers. Front storage compartment (locking) with adjustable shelves for games, coin box, CD's, VCR tapes, and extra controllers. Can still use external controllers such as light guns and hand-helds if so desired. Feed-through notches allow drawer/door closure while external controllers are In use - also prevents theft of controllers. Wide compartment (locking) for up to 2 AV components - add your own CD jukebox, DVD. Karaoke, or sound system. Compartment has an adjustable shelf. Feed-through for Internet hookup. external speakers. etc. Leg levelers for greatest stability and casters for easy moving. Coax Input Jack - cable ready. Patent pending hydraulic tilt screen automatically tips to 90 degrees with the push of a button - helps kids see this screen, perfect for watching television, light gun games, or sit-down gaming. Removable control panel with digital AND analog controllers with over 20 buttons - Identical to the arcades - 2 players. Removable drink holders - will hold up to 40 oz. drinks. Five piece audio system from Cambridge Soundworks includes two internal + two external speakers with stands + powered subwoofer. Removable lighted marquee with easy access light switch - use our logo or Install a custom graphic, such as fraternity letters, family name, etc. Easy hookup design - setup takes less than 15 minutes! Easy access to television functions (channels, volume, menu, headphone, external AV Inputs). Custom bezel design make the television look like a real arcade monitor! No one will guess that you are using a TV. S-video Input for superb picture quality - Up to 600 horizontal lines. Front and rear A/V inputs - easy access to front inputs and headphone output. Variable audio output jacks to connect to a hi-fi audio system. Holds up to 181 pre-selected channels. Dark tint picture tube improves color and picture contrast. The Hovok System Master includes the standard cabinet, the 25" television, and the five speaker sound upgrade. The cost is $2040, with $160 for shipping. Anyone with experience with this cabinet please let us know! Thanks to X-ian for the heads up!